The best guide to essential AcousticGuitarAccessories. Accessories like guitar tuners, guitar humidifiers, acoustic guitar strings and pickups. Those little extra things that make playing guitar just a little more fun. The guitar couldn't be played without some accessories. Have you ever tried playing guitar without strings on it? Pretty tough isn't it. 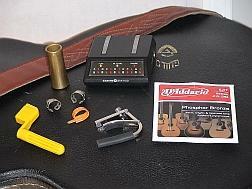 With most of these acoustic guitar accessories we'll look at several of the options available. We'll go beyond just talking about AcousticGuitarAccessories. We'll also take a look at how to use them. There's even an explanation about how to prepare your guitar to use the accessory. There are dozens of versions of each type of acoustic guitar accessory on the market today. It makes it hard to figure out which one is the best choice. So you end up buying a ton of stuff that just ends up stuck in the back of a closet. Trust me, I've boxfuls of unused odds and ends. I hope that the information found here will help you when choosing your own accessories.